Alright, so technically I am jumping the gun on this one. 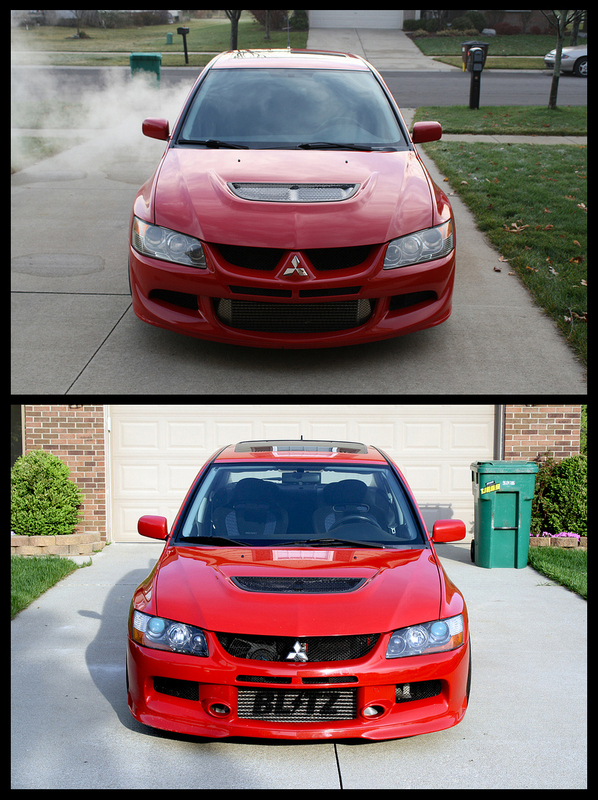 It won’t officially be a year since I bought the Evo for another two weeks or so, but since I had to start de-modding it for winter duty this past weekend I figured I would take some photos to show where the car has ended up after about a year of ownership. I took photos of my 240SX the day I bought it, and with every year that passed I would try to replicate the same photos to remind myself of how far the car had come. When you modify a car, it’s easy to forget all of the little details and small wins you’ve accomplished along the way. It’s cool to look back once a year to see what’s changed with the vehicle overall. The exterior is definitely the area of the car that has changed the most. Since it’s my daily driver, I tried to focus on modifications that were fun to look at/experience every day that don’t really hurt the overall drivability. In this shot you can see the addition of the Voltex street front bumper, side skirts, and rear diffuser. 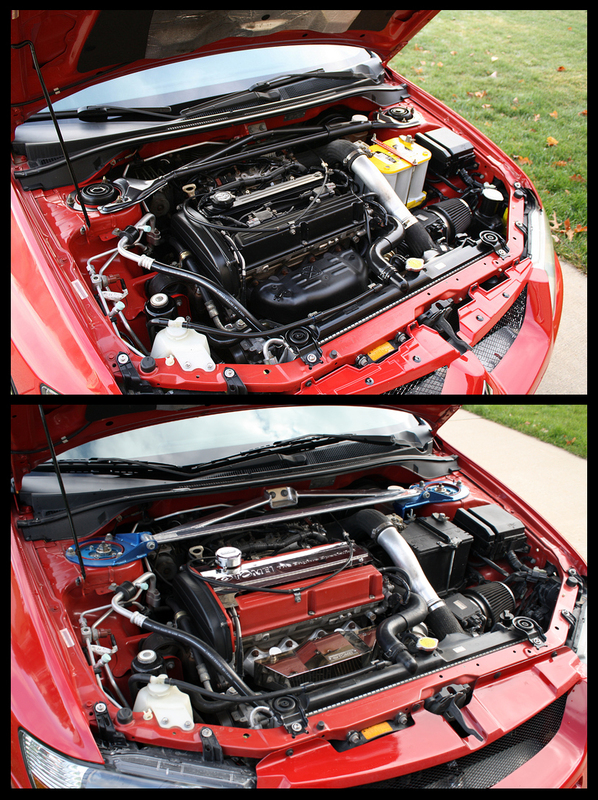 The headlights and side markers were swapped out for the JDM OEM versions. And, of course, the factory mirrors were replaced with a pair of Ganador Super Aero Mirrors. The sky-high OEM antenna has been replaced with a Colt Speed unit. I also installed a genuine Mitsubishi vortex generator and a set of optional window visors. I debated both items and still consider ditching those pieces at times, but for now I’m pretty happy with them. I also decided to remove the window tint that came with the car. I’ve never really been a big fan of tint unless it’s on the right car and I didn’t like how dark it was inside, so it had to go. 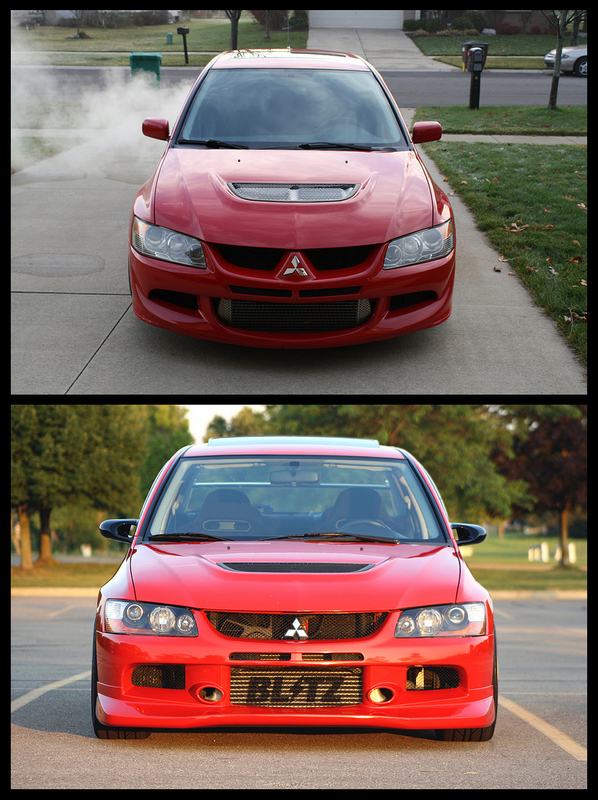 The biggest thing up front I haven’t mentioned already is the Blitz Type CS front mount intercooler. I’ll be powder coating the factory lower hot pipe black this winter so that it doesn’t stick out like a sore thumb. Lots more light inside with the tint gone! I also painted the hood vent rain cover flat black. A decent amount of things have changed out back. The USDM bumper has been replaced with the much cleaner JDM version sourced from my man Russell at MitsubishiParts.net. I ditched the knock off tail lights that came with the car in favor of some OEM JDM VII tail lights. 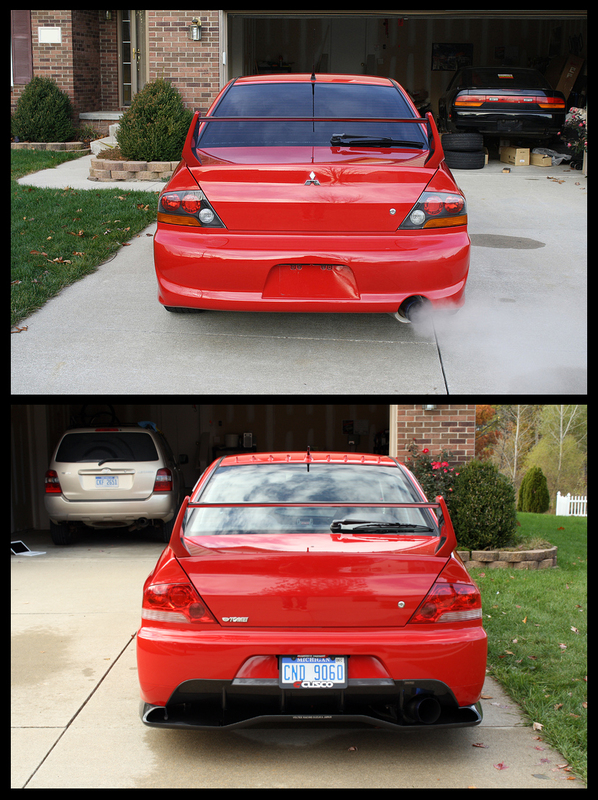 A Voltex CF rear diffuser completes the Voltex theme all around, along with a Voltex CF exhaust shield. I shaved the Mitsubishi emblem and added the Tomei badge to keep things interesting. I’m really happy to say that the gross old Megan Racing catback was ditched in favor of a Tomei O2 housing, downpipe, titanium test pipe, and titanium catback system. Love the sound of this setup, even with the stock turbo still in place. 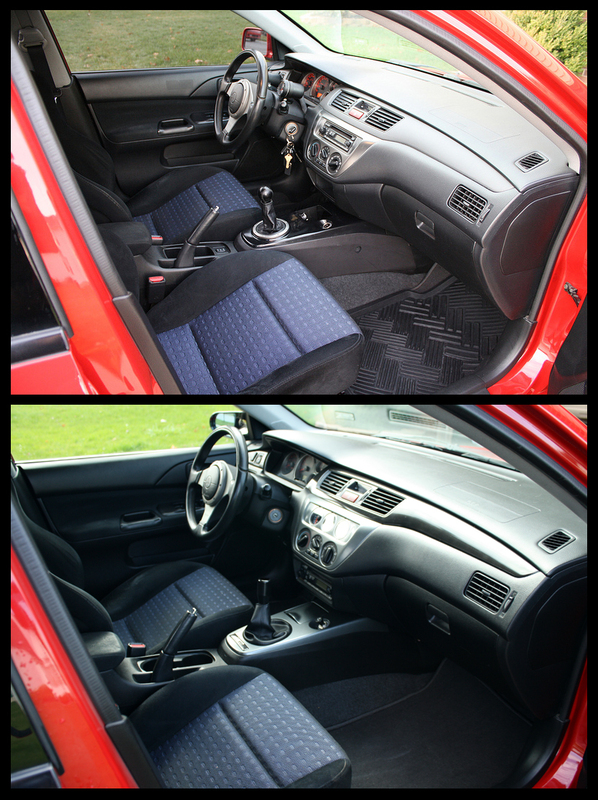 The interior hasn’t seen a lot of change, but I have cleaned up a few things that I wasn’t happy with when I bought the car. The worn rubber pedals were replaced with a set of Evo IX aluminum pedals. The ash tray and a couple of trim panels were missing, so those items were sourced and promptly replaced. Since I ditched the factory intercooler sprayer, I swapped the cup holder with sprayer switch out for the simpler Evo IX cup holder. 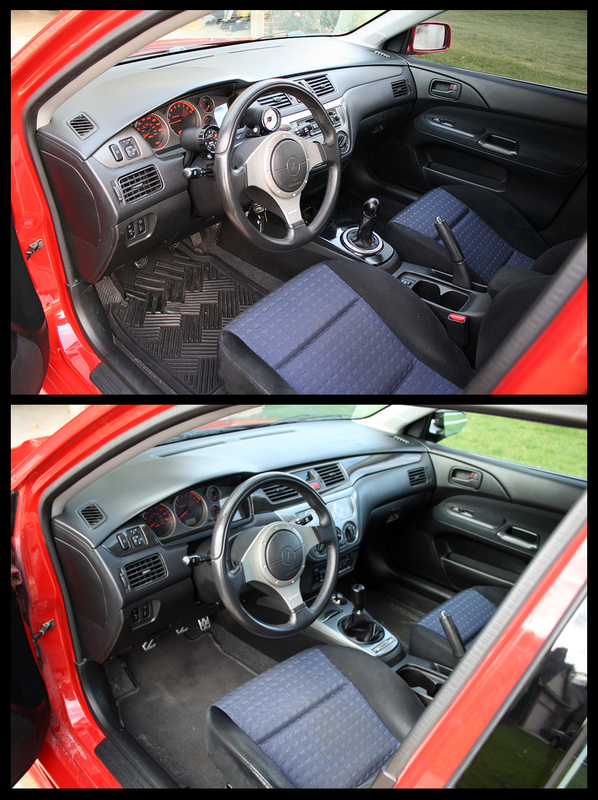 The AEM wideband and Defi boost gauge on the steering column drove me crazy, so those got tossed and I replaced the steering column cover in the process. Apparently all I have done to the rear of the interior is remove the snow brush and put it in the trunk. The back seat occasionally features a car seat for Kinsey now, but that’s about the only change here. 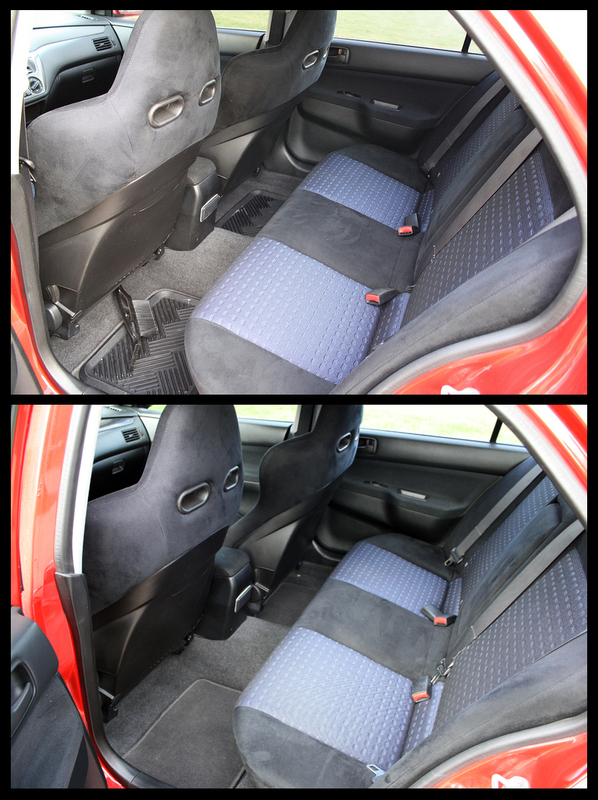 I purchased an Evo IX black rear seat, but I’m waiting for some other interior changes before I install it. Hopefully this photo will see some more change next year. 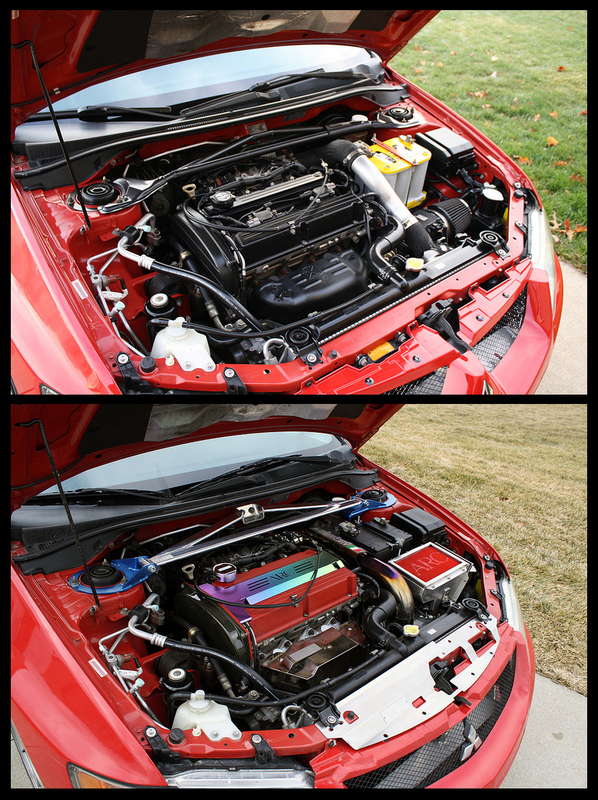 The engine bay saw a few items change, but nothing too drastic. The old Optima battery was pretty tired, so I replaced that. I had the valve cover powder coated wrinkle red and the factory exhaust manifold ceramic coated silver when everything was out for the exhaust install. A Tomei exhaust manifold cover, spark plug cover, and oil cap were added to make things just a little more interesting. 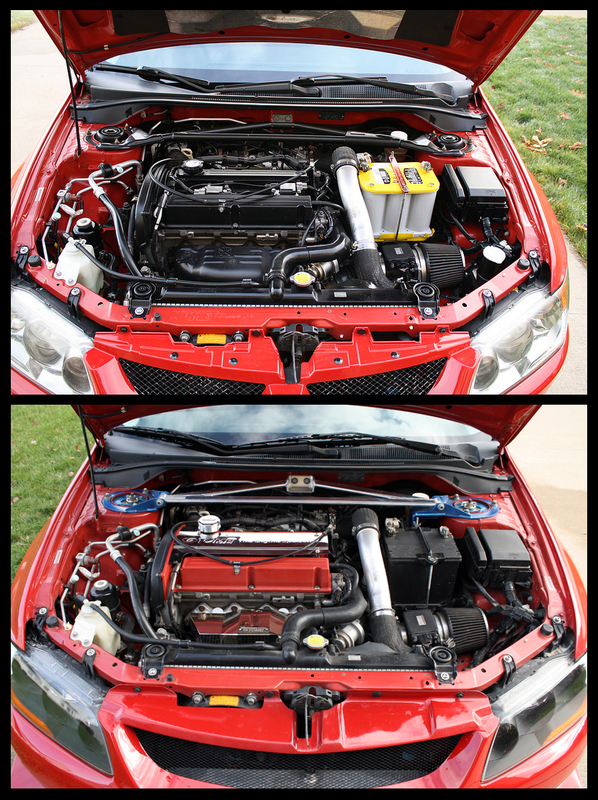 Finally, I added Cusco Type OS strut tower bars to the front and rear of the car (rear not pictured of course.) I had the car street tuned by some local Evo gurus to fix some drivability issues, but I left the GSC S1 cams that came with the car in there. It seems to run well with them, so I decided not to mess with swapping them out for a pair of HKS 272 cams I had purchased purely based on my love of Japanese tuning parts. Perhaps I’ll try another set when I change the timing belt, but I like the response and the drivability of the GSC S1 cams. The engine bay was actually a lot cooler back in March of this year, but I came to a point in the build where I had a realization. I had sourced a bunch of cool ARC doo-dads for the bay and spent a good chunk of change. But as the weather got nicer, I realized I still needed a lot of stuff to be happy with the car- wheels, summer tires, coilovers, some exterior mods, etc. While the ARC stuff was cool, it really didn’t make much sense in a daily driven car that wouldn’t really see any time at shows. I would have held onto it, but ARC stuff is crazy valuable in the Evo world- so most of it was sold to fund my other projects. Here’s what the bay looked like back in March before I changed things up- definitely miss some of these components. I don’t think I’ve seen another ARC upper intercooler pipe for sale since I let mine go, but I got just about a mortgage payment for that thing- so crazy! ARC Evo collectors mean business, lol. 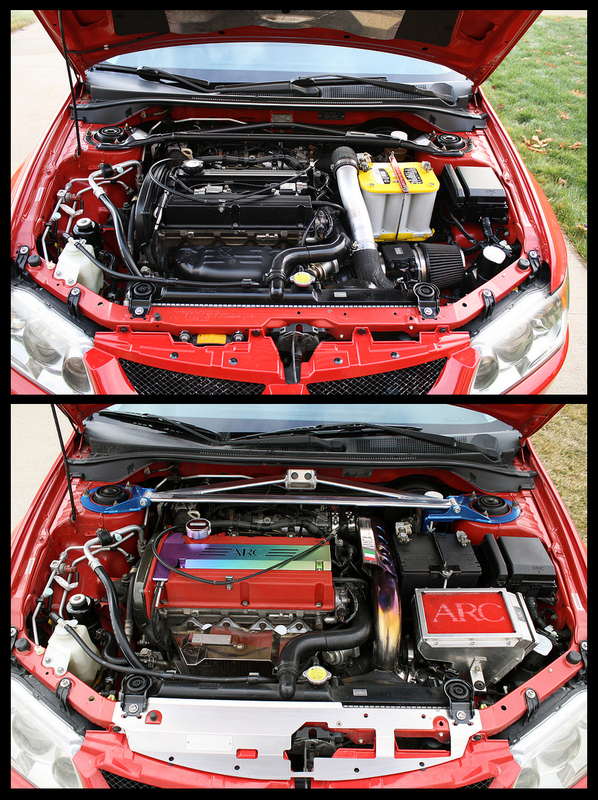 I’m hoping to slowly add some of these modifications back again as time goes by, like some upper intercooler piping, an intake, and a radiator cooling shroud. Probably won’t go with ARC again just because of how expensive that stuff is usually price wise, but we’ll see I guess. 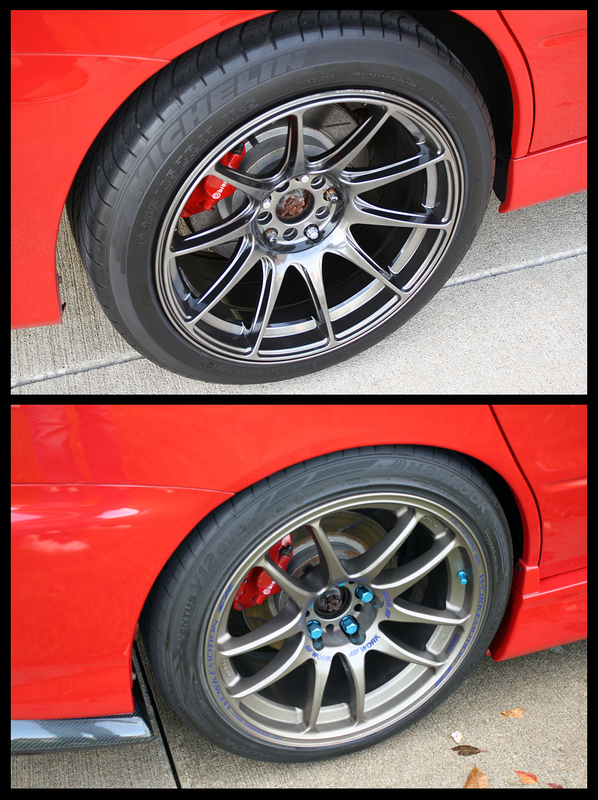 I’m also happy to report the XXR wheels that came with the car were sold shortly after I bought it and replaced with a set of 18×9.5 +20 Work CR Kai wrapped in 245/40/18 Hankook summer tires. I also sourced a set of OEM VIII wheels and Hankook snow tires for winter duty since the stock wheels weren’t provided. I chose to go with some blue Work lug nuts, and was lucky enough to be hooked up with some KW V3 coilovers by Peter at Modified. Really happy with the height of the car thus far. It’s nice not to drag the exhaust/frame rails everywhere like I did with the S13 ad to have the ability to do some spirited cornering occasionally. Maybe I’m just getting old, lol! I’m considering switching up my wheels and tires next spring, but we’ll see what happens. I don’t think I’ve owned a set of wheels for two seasons yet, so that would be a first! I do like the CR Kais though, and they’re great for the price. I’ll need to refresh the brake pads and rotors at some point in the next year too. I think the only other area of the car that changed a few times in between during the course of the year that’s worth mentioning is the front bumper setup. I had originally told myself I was only going to do the Evo IX front end with SE lip if I could and call it a day, but I got sucked into doing Voltex aero shortly there after. First came the IX front bumper with OEM optional SE lip. Looking back, I think this is a really cool look. I know a lot of people consider this the car’s best setup before I ruined it with Voltex stuff, LOL! 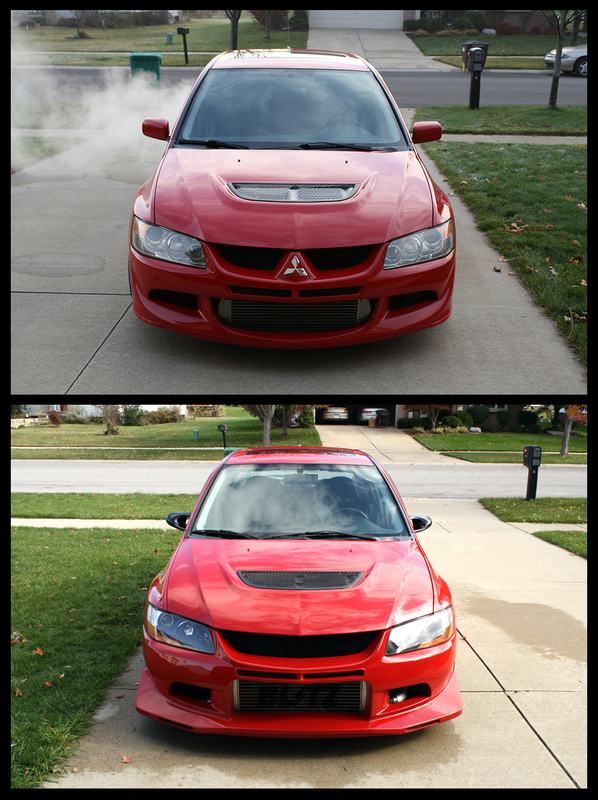 It’s also worth noting I had a set of JDM IX headlights on the car for about three days. I was told they were the version with fog lights, but they ended up being the non-HID halogen version without fog lights. 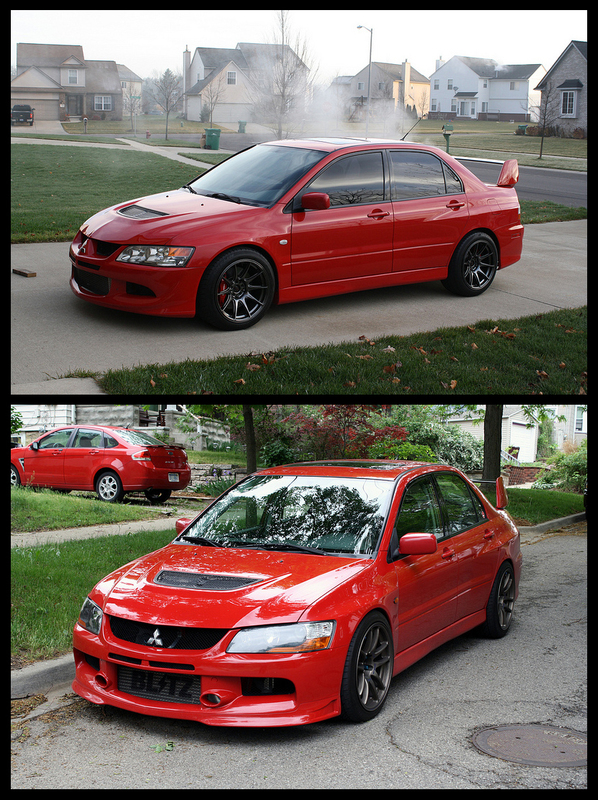 My car came with the HIDs and fogs, so I sold them after about a week and picked up the VIII MR HID version. After that wasn’t enough, I ended up installing a Voltex front lip for the IX bumper and Voltex side skirts. 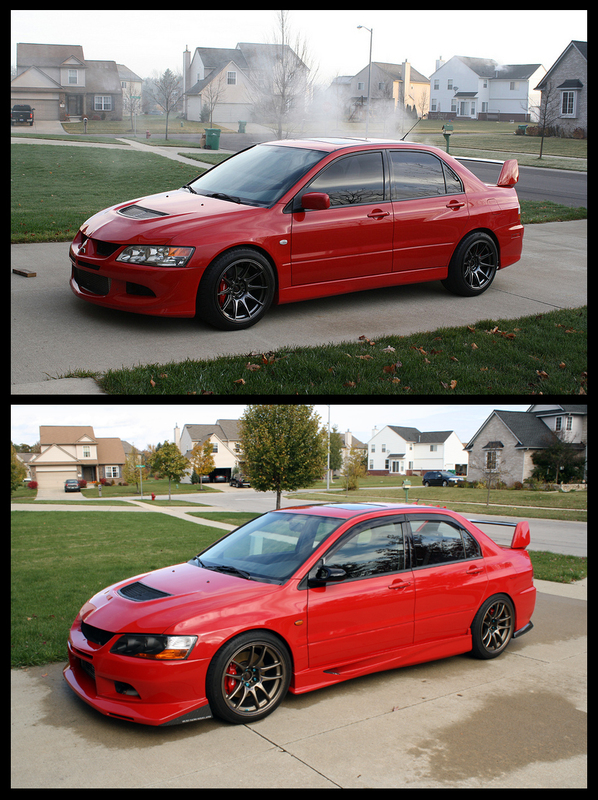 My plan was to use the Voltex lip and sides in the summer and the SE lip with stock sides in the winter. Once I got the diffuser though, I felt that the lip just wasn’t aggressive enough… so I sold it to fund the purchase of the street front bumper. I’m rocking a beat up VIII bumper for winter duty now, which is far less attractive- but the summer look makes it worth it to some extent. So that about sums up my first year of Evo ownership. I’m pretty happy with my changes to the car, and despite the fact that I haven’t made it a ton faster or as crazy of a build as my 240 was, I’m pretty happy with it. I’ll probably dink around with the interior and maybe even some smaller aspects of the exterior down the road, but I don’t foresee things changing too much down the road. But then again, how many times have you heard THAT phrase come out of my mouth? I get asked on Instagram about once a week why I sold my S13 and if I regret it. I can honestly say that I don’t regret parting it out and starting a new chapter of my life. Being a father of one (with another one on the way this April) has definitely changed my outlook on car modification and the amount of time and cash I have free for it. I wouldn’t change it for the world, but a build as in depth and a car as impractical as the S13 really wouldn’t fit into my life anymore. 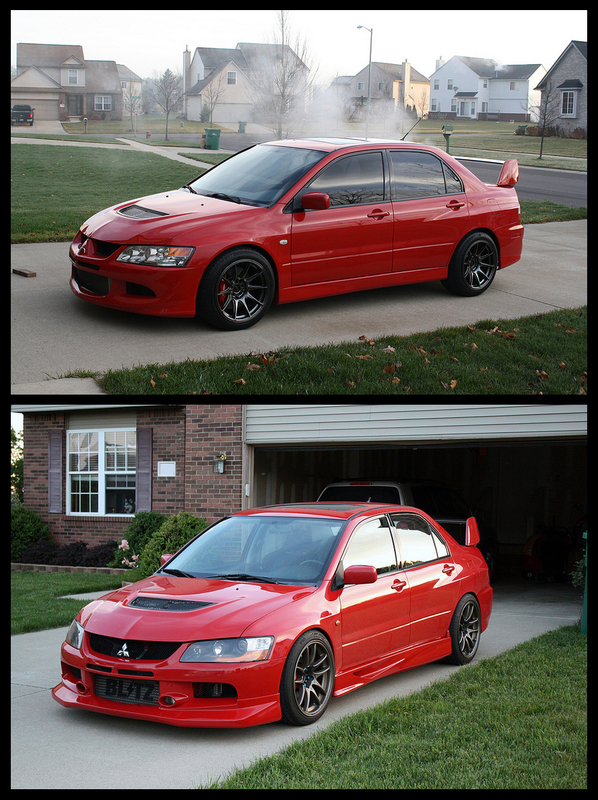 It was a blast while it last and I’ll always love that car, but the Evo is a great fit at this stage of life. Thanks for reading- I’ll try to get back to what everyone really wants to see (The Cozy Coupe) really soon. Damon, whats your instagram man? Would love to follow you. Sorry if you’ve already said, but I dont recall reading it. Great work as always dude. 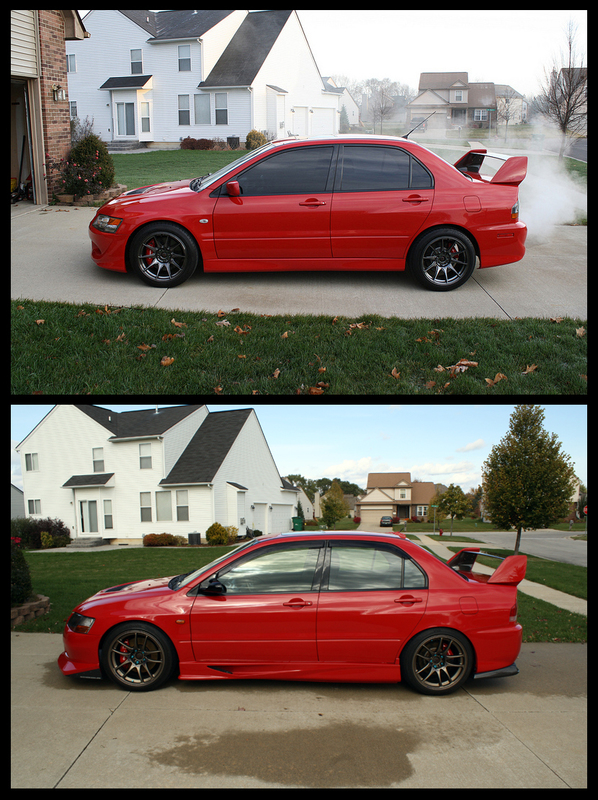 Miss swing the 240 but your right the Evo seems to be a great fit for you. By the way love seeing the crazy coope build/progress! Update will be coming soon this week! Awesome! Hope all is well!